The Perfect Tailored Solution For Long Term Outdoor Storage. Hard wearing material ideal for long-term outdoor protection, Storm Shield+ is a tri-laminate fabric with a breathable membrane which allows condensation to evaporate away from the surface of the car, preventing the paintwork from damage. 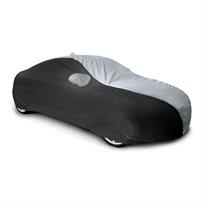 3 layers protect from knocks, scratches, rain, bird droppings, etc. Please use the Find My Car link to select the correct pattern from over 30,000 available. Don't worry if your car is not listed, simply contact our support team on 0333 800 804 or email carcovers@uf.direct. We are all enthusiasts who love talking about cars. All covers are tailor-made to order. Please allow 14 - 21 working days for delivery. UK courier delivery is provided free of charge on all orders.